Check out this hilarious video skit of what would happen if a combat veteran encountered a clown that was trying to prank them. In 2016, there were a bunch of sightings of clowns terrorizing American neighborhoods across the country. Many of them were innocent pranks, but there were also several others wielding knives and threatening schools. Many people encountering clowns have the immediate reaction to sprint away in fear for their lives. However, who is to say what would happen if one of the millions of veterans in America came face to face with one of these clowns. 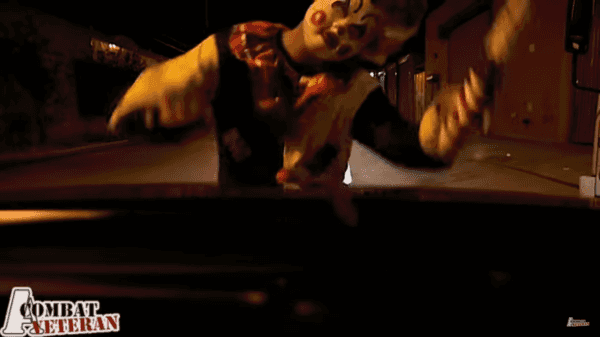 In the video, two veterans are driving through a dark back alley when they suddenly stumble upon an eerie looking clown. 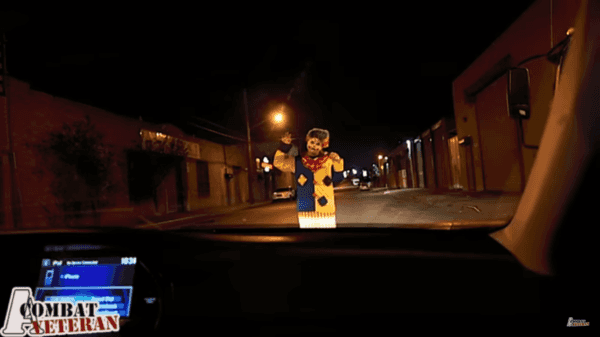 The clown is in front of the car, so they cannot move forward without either running over it, waiting until it gets out of the way, or removing it. In addition, the clown is swinging a large hammer that makes it seem even more intimidating. At this point, the veterans are angry that this clown is blocking their path. The veteran in the driver’s seat mentions that “the last one got shot” and it’s clear that he’s ready to confront this daunting clown. 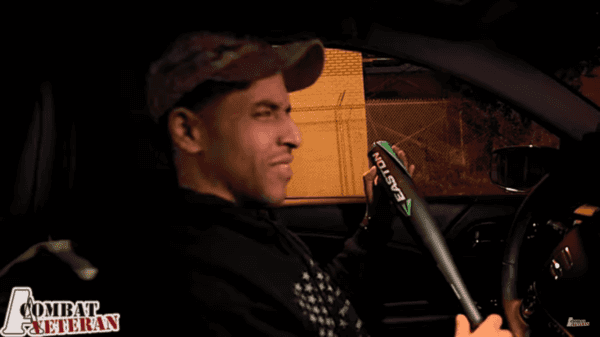 The driver asks his passenger, to give him “Bam Bam.” It turns out that “Bam Bam” is what he calls his baseball bat. Now with the baseball bat in his hand, the veteran gets out of his vehicle, approaches the clown, and takes a giant swing. He then follows that up with yet another solid swing that immediately knocks out the clown. The passenger then gets out of the car, grabs the clown’s hammer, and then begins taking swings at him too. After knocking out the clown and yelling some profanity at him, the veterans get back into the car and ran over the clown. After running him over, the driver mentions that it sounds like the clown “broke a bone.” This was a clear victory for the veterans and a devastating defeat for the clown. The two veterans then celebrated their success by going to McDonald’s for a bite to eat. These veterans took it upon themselves to directly confront the clown with strength and courage rather than being afraid of it and running away. In the future, clowns better think twice before crossing paths with veterans. Make sure to watch the full video below to see how these veterans took out this threatening clown. You won’t want to miss out on this hilarious skit.